That Bubblegum McFloat sounds pretty gross. There's a bit of backstory to this one. About a month ago, a friend of mine from Hong Kong came down to Singapore for a business trip. I asked her to bring me the "Batman Burger" so I could give it a review. 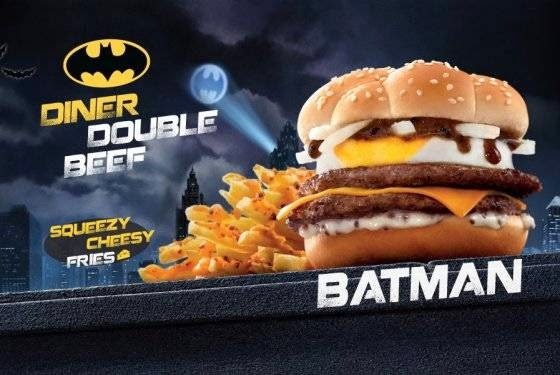 The Batman Burger was the first of 4 DC comic crossover promos in Hong Kong. I guess my typical bad luck follows me, even when I'm the one not buying the burger, as when she went to buy it for me at the airport branch, they were completely sold out! 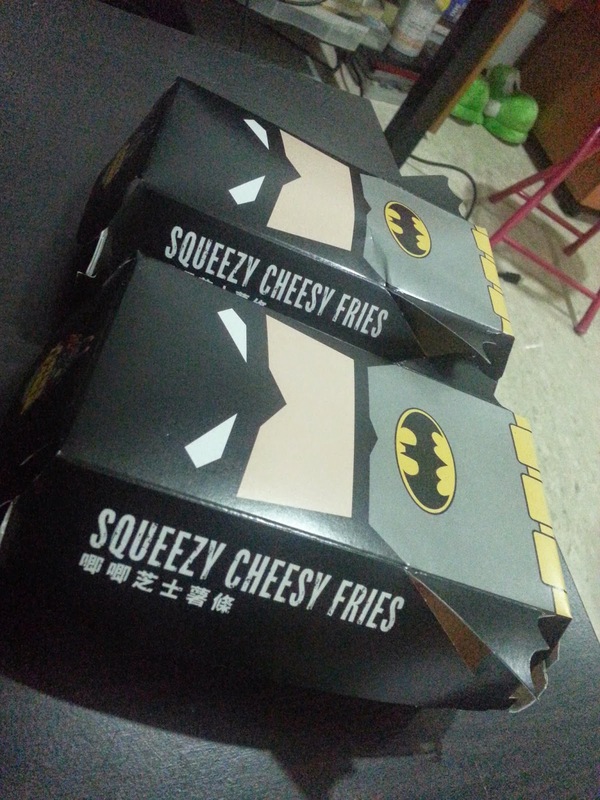 She bought me 10 Packages of Batman Bacon Cheese Fries in consolation (I'll talk more about that at the end of the review), but I was really looking forward to trying that burger! I vented my frustration on Facebook and Twitter, and a fellow reader Valerie, said she was going to HK in a few weeks and offered to bring one for me. I knew the Batman burger was on it's last legs (it ended 2 days later), but I asked her to bring me the new Superman promo items. 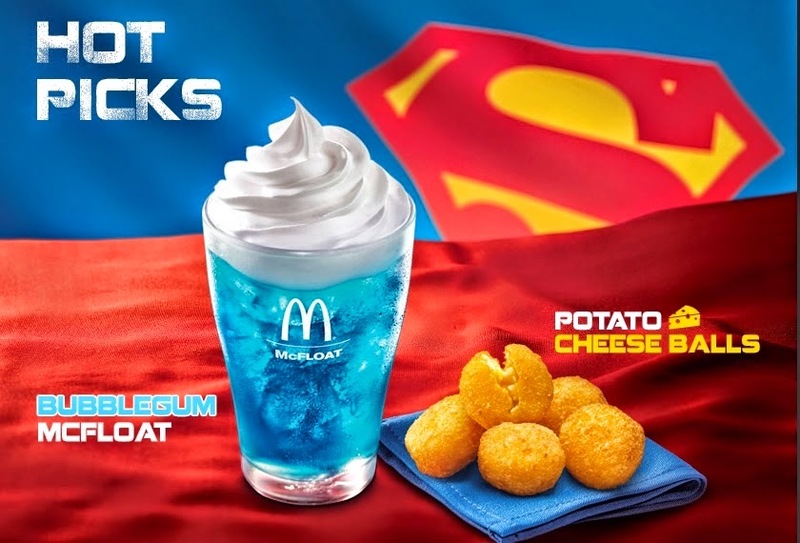 The first of which I'll review now - The Superman Potato Cheese Balls! Since Valerie had purchased them in HK, they were a tad bit cold once I finally got home after meeting her at the airport. I tossed them into a pan (sans oil) to give them a bit of heat. Once golden brown and toasty warm, I gave the first ball a try. My wife was busy with something, but I immediately told her that I knew she was going to love it. I walked over and tossed one in her mouth and her first word was a very enthusiastic, "YUM!" There wasn't much too these really - they are a deep fried potato ball, but it wasn't a mash, it was more like small bits of hash brown held together with cheap cheddar cheese surrounded by a batter shell. My initial thought about these was they were going to be heavy on the cheese, and light on the potato, kind of like a mozzarella stick, but in reality it was the reverse. It was at least 75% potato and only 25% cheese. As mentioned, the cheese clearly wasn't gourmet cheese, but it also wasn't the cheapest processed cheese either. It's probably akin to those premium cheese promo burgers they run, it wasn't anything you'd buy for your house, but it was better than the typical McDonald's cheese slice. I was also surprised by how well they survived the flight down from Hong Kong. After heating them up in the pan, if I didn't know any better, I would have never guessed these were fried 6+ hours ago. Although the coolest thing about these had to have been the promo packaging. Singapore - take note, this is how you do packaging. A preview of what else is to come! One other thing to point out is how cheap they were. Only $3.50 with a Superman combo purchase! That's less than 50 cents US for 5 balls. 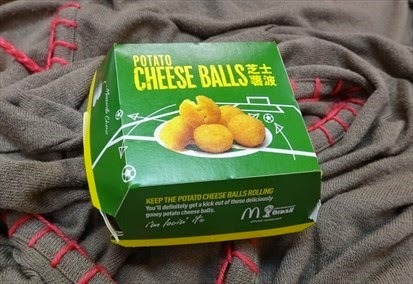 In Singapore, I could easily see them trying to charge $4 for the same 5 balls. I also didn't forget about the Batman Burger and Bacon Cheese Fries! When I said my friend brought me 10 sets, I wasn't kidding...Unfortunately what she didn't know was that I had already tried this same item from Japan. 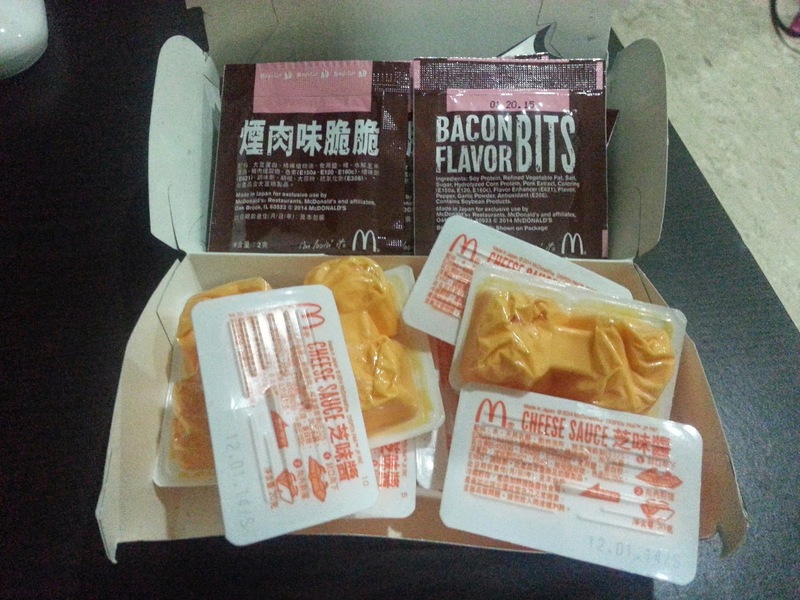 Although the packaging is now in English & Chinese, the Hong Kong product was also made in Japan, so it was 100% identical. That means I'm sitting on a whole bunch of Squeezy Cheese that I don't know what to do with. If you'd like to swap for a sauce/shaker from your country, I'm always up for it!